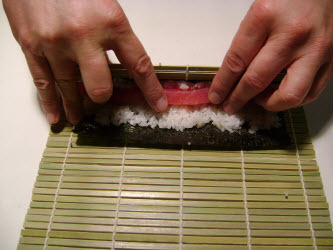 Hosomaki - Traditional thin Sushi Roll - Learn how to make it! Hosomaki rolls are becoming quite popular as light lunchtime or snack time fair as they are small and bite sized. They can be quite healthy, as the sushi rice contains rice vinegar which has antibacterial properties and is also known for its ability to help lower blood pressure. 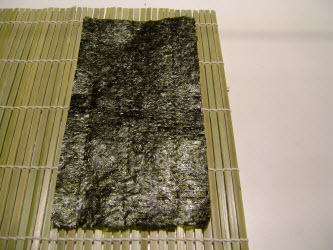 The nori also has quite the health benefit as it contains iodine as well as vitamins A, B1, B2, B6, niacin, and C while also helping to curb the formation of cholesterol deposits in the blood vessels. Add in a fish like salmon or tuna which are high in omega-3's and you can see why the Japanese people have one of the longest life expectancies of any people in the world. Hosomaki usually only contains 1 ingredient and is about 1" in diameter when assembled. 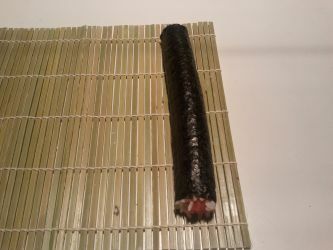 Because of its thin diameter, most people find it harder to roll than the next larger chumaki roll. Tekkamaki - This one is made with Tuna and actually originated in gambling dens called "tekkaba". They were considered a quick snack that could be eaten with one hand (much like a sandwich) while still being able to use the other hand for gambling. 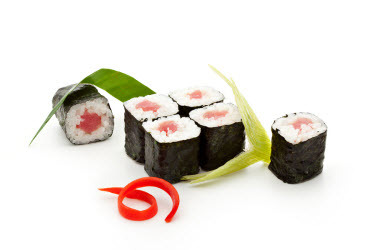 Kappamaki - this roll is made with Japanese cucumber and is traditionally used to cleanse the pallet between the different kinds of seafood or fish. 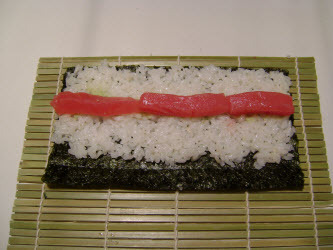 Negitoromaki - Chopped fatty tuna (toro) is usually used for this roll, with a bit of chopped scallions (negi). Kanpyomaki - Marinated dried gourd strips (kanpyo) is the main ingredient in this one. Takuan Hosomaki - This roll is made with takuan (pickled daikon). 2. It had 1 ingredient in it. Just try to note what ingredient and condiments it had in it so you can duplicate it later. Ingredient for filling sliced into approximately 3/8" square matchsticks (like Tuna, crab, Japanese or hot house cucumber, Takuan (pickled daikon radish), salmon, or seasoned kampyo gourd strips. 1. 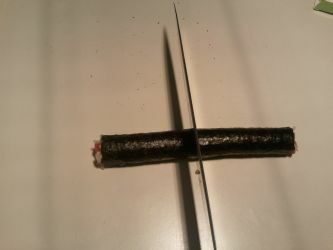 The Hosomaki roll is made by taking a 8 x 7 inch sheet of Nori and cutting the sheet in half on the 8 inch side so that you end up with two 4 x 7 inch sheets. See pictures above. 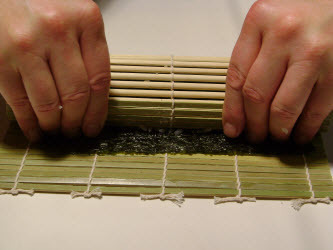 You can also fold over and break the nori sheet in half. 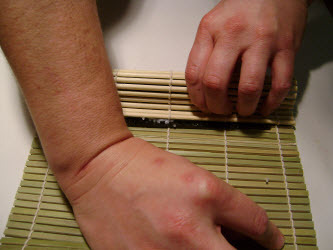 The slim hosomaki roll can be one of the most difficult for beginners to roll without rice squeezing out from the seams. 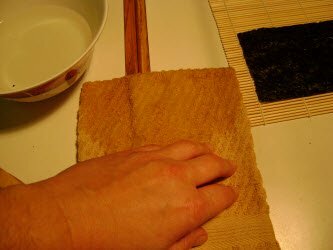 To make it a lot easier, cut your nori at 5x7 instead of 4x7 and leave a full 1" at the far edge when you spread out your rice. This trick will help you make a perfect hosomaki roll everytime! 2. 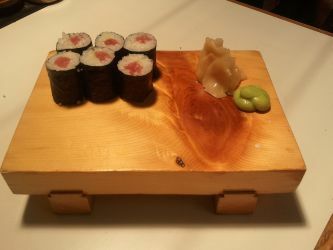 The sheet is then laid on a bamboo sushi mat, shiny side down, with the 7 inch side closest to you. Leave about 3 or 4 slats visible on the side nearest to you. 3. One of the best ways that I have found to make your hosomaki rolls a consistent size is by measuring your rice each time. Take your 1/2 cup measure and moisten the inside with vinegared water so that the rice will not stick. Shake out any excess. 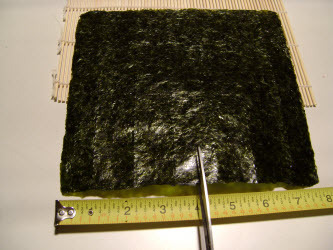 Then measure out 1/2 cup of rice and put it on your nori sheet. Refer to the pictures above. 4. 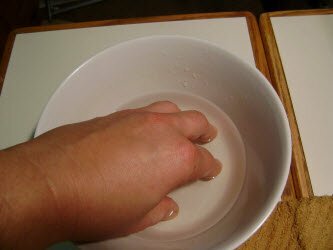 Dip your hands in vinegared water (1/4 cup rice vinegar + 1 cup water) and tap your fingers on a folded damp rung-out towel to remove any excess water. 5. Spread the rice over the entire sheet coming to the edges on the right, left and closest to you but leaving about a 1/2" strip along the 7 inch side farthest away from you. The picture above is taken from the side farthest away from you so that you can see the 1/2" strip of nori used to seal the roll. If you need to leave 3/4" to make sealing a little easier that is ok too. 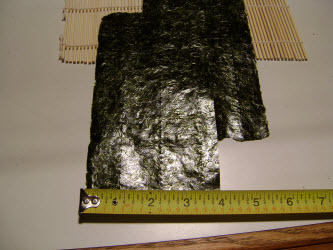 Leave a 1" strip if you cut your nori to 5x7 instead of 4x7 to make rolling easier. The rice will be very sticky, so moisten your fingers often. 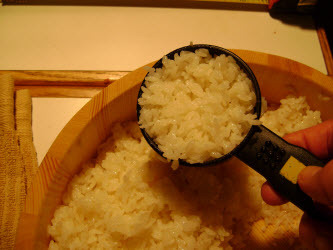 And also, it helps to push the rice from the center to the edges quickly and evenly. 6. 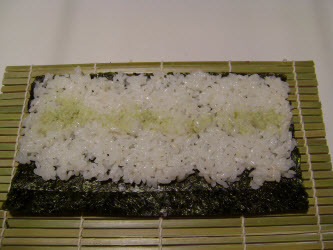 If using wasabi or a condiment of some sort, spread it across the center of the rice. See pictures above. 7. Spread a row of a single ingredient like salmon, tuna, crab or cucumber across the center of the rice. 8. Lift the edge of the mat closest to you with both hands by putting your thumbs under the mat and while lifting up, use your fingers to hold the fillings in place. 9. 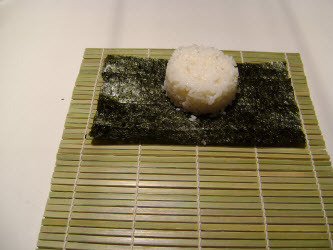 Keep rolling, while pressing the fillings into the rice and stop when the mat touches straight down on the far edge of the rice. Make sure the exposed nori is still visible. 10. Tighten up this part of the roll by pulling the mat covered part of the roll with your left hand while also tugging 3 times on the free edge of the mat with your right hand; once in the center, once on the left and once on the right. 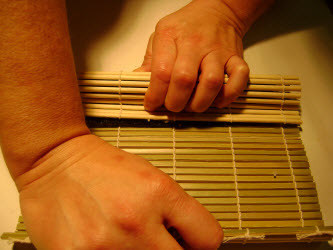 The pictures above showing tightening in the center and left side of the roll. You also need to do the right side. You should see more exposed nori now because you are "tightening" the roll. 11. 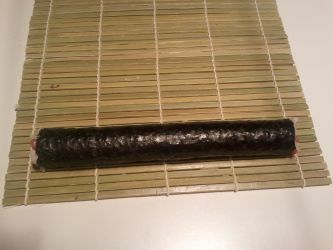 Now, continue to roll until the exposed part of the nori has been rolled under. Hold it still for a little bit to allow the roll to seal. 12. Wipe your sushi knife with the damp vinegared tea towel so that it won't stick to your roll when slicing. 13. Slice into 6 or 8 pieces and serve. Looking for Something in Particular? Search this Site using Google Below! Visit AllAboutSushiGuide's profile on Pinterest. Want Over 1.3 Million Sushi Lovers* to See Your Product, Service, or Business? Copyright © 2013-2018 By David Guthrie DCG Worldwide Inc, AllAboutSushiGuide.com, InfoTechCopywriter.com. All rights reserved.